Metro Restoration 2010 Timetables and Route Maps are now available online. All of these changes will begin on Monday, June 28. Please take some time to look at the various changes and see how your commute could be affected. Both Google Transit and TripFinder will be updated so you can plan your trip online or via Google Maps app for your smart phone. Weekday rush hour service enhanced, with trains every 12 minutes on the Red Line and the Blue Line, and every 6 minutes from Forest Park to Fairview Heights. #3 Forest Park Shuttle – Service began on Saturday May 29, 2010. During operating hours of the #3 Forest Park Shuttle. The #90 Hampton will not operate in the park. #4 Natural Bridge – To provide a safe transfer at the Civic Center Station between buses and MetroLink the route will be changed to boarding location southbound on 14th Street @ Spruce. Eastbound trips from east on Market, right on 14th end of route at Civic Center Station. Westbound from Civic Center Station, continue south on 14th, right on Chouteau, right on 18th, left on Market via regular route. #17 Oakville Laclede Station – Route changed to serve WAC on Green Park Industrial Dr. and time adjustments. #32 Wellston ML King – Trip added leaving DePaul Hospital at 11:28PM Weekdays. #41 Lee – To provide a safe transfer at the Civic Center Station between buses and MetroLink the route will be changed to boarding location southbound on 14th Street & Spruce. Eastbound trips continue south on 14th end of route at Civic Center Station. Westbound from Civic Center Station, continue south on 14th, right on Chouteau, right on 18th, right on Market, left on 14th via regular route. 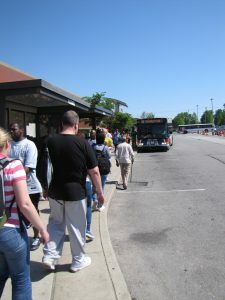 #48 South Lindbergh – Service provided between Ballas Transit Center and Veterans’ Hospital via South County Mall. #58 Clayton Ballas – Will operate between Clayton MetroLink Station and Ballas Transit Center. (See #158 Ballas – West County for service to the hospitals and Delmar Gardens Chesterfield and West). #64 Lucas Hunt – Rush hour service restored. #70 Grand – Service improvements Monday through Sunday. #90 Hampton – The #90 Hampton will not enter Forest Park Monday through Sunday between the hours of 9am and 7pm due to traffic. Passengers proceeding into Forest Park will need to transfer to the #3 Forest Park Shuttle at the Forest Park Station. Twenty minute rush hour service provided weekdays and additional service provided between Hampton Loop and Catalan Loop seven days a week. #95 Kingshighway – Service improvements Monday through Friday. #97 Delmar – To provide a safe transfer at the Civic Center Station between buses and MetroLink the route will be changed to boarding location southbound on 14th Street @ Spruce. Eastbound trips continue south on 14th end of route at Civic Center Station. Westbound from Civic Center Station, continue south on 14th, right on Chouteau, right on 18th, right on Market, left on 14th via regular route. #99 Downtown Trolley – To provide better coverage in downtown St. Louis this route will provide service on Market Street and on Washington to the City Museum. Northbound from Civic Center, right on 14th, right on Market, left on 4th Street, left on Washington, right on 16th, end of route at 16th and Delmar. Southbound right on Delmar, right on 14th, left on Washington, right on Broadway, right on Market, left on 14th end of line at Civic Center Station. #158 Ballas – West County – New route providing service from Ballas Transit Center to St. John’s Hospital, Maryville Center and Maryville University, St. Luke’s Hospital, Delmar Gardens Chesterfield & West, and Cedars at JCA. This route will be timed with the #58 Clayton Ballas and #258 Clayton Chesterfield at the Ballas Transit Center. #210 Fenton Gravois Bluffs – Service area expanded to provide service via Friendship Village South, Wal-Mart and Allied College on Gravois Bluffs Blvd. #36X Bissell Hills Express – Line number changed from #240X Bissell Hills Express. Schedule remains the same. #258 Clayton Chesterfield – Westbound trips extended to exit Spirit Airport Blvd. We look forward to being out there and bringing better service to St. Louis. Another round of restoration service changes will come on August 30. Hi Jennifer – do you know when Google Maps data will be updated? New service stats today, but Google does not seem to have the data. Google is aware of the issue and is working on getting our data posted to the site. In the mean time, please use TripFinder. A link to the software is on metrostlouis.org’s main page.